[caption id="attachment_4100" align="alignleft" width="150"] Tilman Schwencke, General Manager - SMart Wind[/caption] Tilman Schwencke has been appointed General Manager for SMart Wind (the 50:50 joint venture between Mainstream and Siemens Project Ventures - an entity owned by Siemens Financial Services). Schwencke will lead the team in delivering the 4GW Hornsea Offshore Zone. Commenting on his appointment he said: “I am delighted to take the lead on the Hornsea Zone at such an exciting time; we have agreed Agreement for Leases for the full 4GW with The Crown Estate and we have also signed up 4GW of grid connections with National Grid.” Schwencke has been with Mainstream for more than five years leading the development of the Horizont offshore wind farms in the German North Sea which has a potential capacity of over 1.3GW. Before joining Airtricity in 2007 where he worked on the development of the German offshore wind farm Butendiek, the qualified lawyer worked for the United Nations in Vienna and was energy adviser in the European Parliament in Brussels. 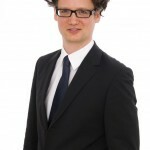 Tilman is a member of the board of the Offshore Forum Windenergie (OFW) and has published various articles and papers on European Energy policy.